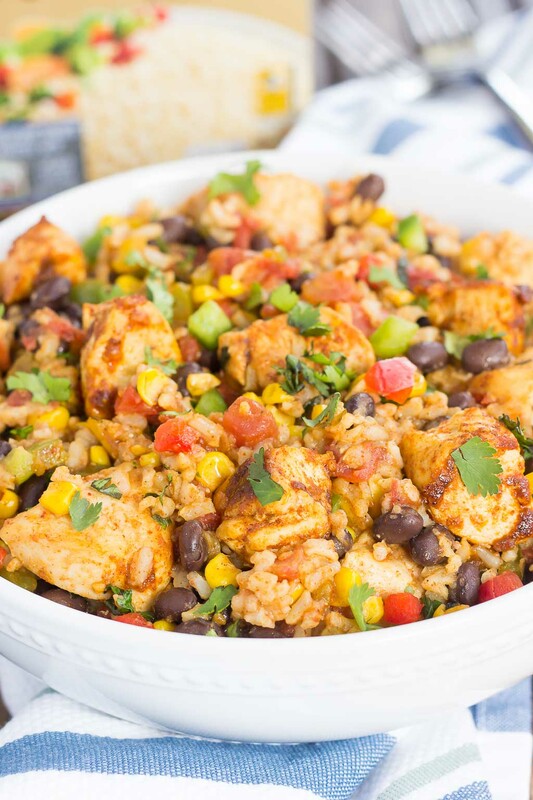 These Southwest Chicken and Rice Bowls are packed with flavor and perfect for weeknight meals. 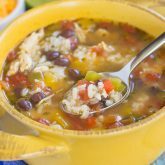 Filled with tender chicken, brown rice, bell peppers, corn, black beans, and a mixture of spices, this zesty dish is simple to prepare and ready in no time! I’m still in awe that it’s back-to-school time for the kiddos around here. Although it’s still officially summer for about another month, I can’t help but think about all of the things that get me excited about fall. And when I think of fall, I always think of going back to school, even though my school days are long behind me. Besides everything apples and pumpkin, I love creating easy dinner ideas. But, you already knew that, right? I’m all about the simple recipes around here, and when back-to-school time hits, I love sharing some meal solutions for those busy parents or working adults. And even if you don’t have any kids, we could all use a few more easy dinner ideas in our life, right? 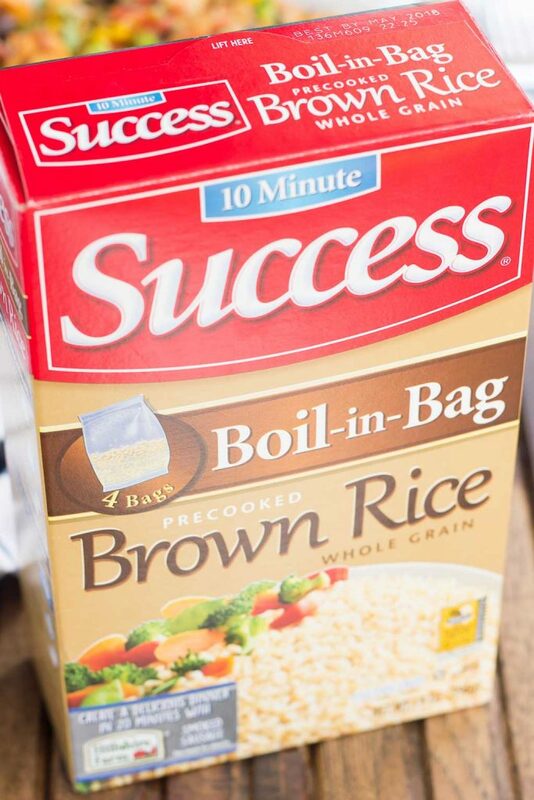 When I was grocery shopping a few weeks ago, I stumbled upon Success® Rice. Have you tried it before? It’s the original no measure, no mess, boil-in-bag rice that cooks perfectly and is ready in just ten minutes. Success Rice can be made on the stove or in the microwave, without sacrificing the quality and taste. Sounds pretty good, right? And since it’s a staple in my kitchen, it can be used for breakfast, lunch, or dinner. Success Rice is also gluten-free, non GMO and packaged in pre-measured colander-style bags. Success® Whole Grain Brown Rice comes in two different sizes (14 ounce and 32 ounce bags) and can sit in hot water after cooked for up to 30 minutes. This rice is perfect for those busy weeknights and back-to-school meals. After stocking up on Success® Whole Grain Brown Rice, I headed home to whip up a back-to-school meal. 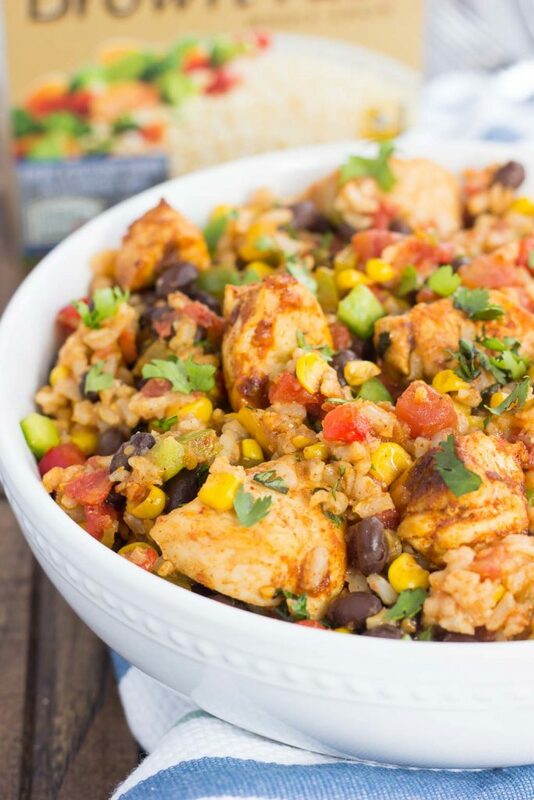 These Southwest Chicken and Rice Bowls are packed with flavor and perfect for weeknight meals. Filled with tender chicken, brown rice, bell peppers, corn, black beans, and a mixture of spices, this zesty dish is simple to prepare and ready in no time! 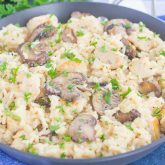 The flavors in these Southwest Chicken and Rice Bowls are what makes this dish extra delicious. The spices from the taco seasoning, punch of flavor from the ro-tel tomatoes, and the fresh veggies make this a meal time (and back-to-school time) winner. Southwest-inspired anything is a favorite of mine, so I knew these rice bowls would be devoured in no time. The ingredients are fresh, simple and full of flavor. This dish also makes the perfect leftovers for back-to-school lunches. What could be better? And besides the delicious taste, these bowls are a breeze to whip! 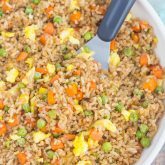 Thanks to the ease of Success® Whole Grain Brown Rice, you can prepare the rice and then let it sit while cooking the chicken and veggies. Once everything is ready, toss it all together and get ready to be wowed. Quick, easy, and jam-packed with a southwestern flair, these Southwest Chicken and Rice Bowls are bursting with fresh ingredients and made for busy nights. So grab those ingredients and become the star of the dinner table! Want to learn more about Success® Rice? Then check out their website for more information! Prepare Success® Whole Grain Brown Rice (or other rice) according to package directions. Set aside. Heat a large skillet over medium heat. Add olive oil and chicken. Sprinkle with 3 tablespoons taco seasoning. Cook chicken about 3-4 minutes, per side, until browned and cooked through. Remove to a separate plate. In the same skillet, add green pepper, red pepper, and yellow pepper. Sauté for about 4-5 minutes, or until tender. Add more olive oil, if needed. Add corn, black beans, ro-tel tomatoes, and cilantro to skillet. Stir to combine. Add prepared rice, chicken, and rest of taco seasoning. Stir to combine and let simmer for 3-4 minutes, or until heated through. Remove from heat. Spoon into bowls and top with more cilantro, if desired. Thanks, Kate! I agree, this is perfect comfort food! Haha a new wardrobe would be perfect! :) Thanks for the kind words and pin, Dawn! I'm in love with brown rice. Haven't eaten the white stuff in years. That nutty flavor and the fullness brown gives is so much better! This rice bowl is awesome. My husband will love! I love brown rice, too! It's definitely my favorite kind. Thanks for kind words, Mir! Oh my goodness, I LOVE Success rice! I mean, it's totally the easiest way EVER to make rice fast! These rice bowls are absolutely SO up my alley----I'm always down for anything southwest-themed and this looks like total Monday food to me! Isn't Success rice the best? I love how easy it is, too. Thanks for the kind words, Sarah! I totally agree that we could all do with some more easy dinners in our life, especially when they are as delicious as this one looks. This is comfort food at its best, packed full of flavour too. What a smart idea to use taco seasoning!!! I love this! and I love that they have whole grain brown rice!!!! this looks so flavorful and delicious! yum! Thank you, Alice! This is a favorite dinner of mine! Well, that sounds amazing. Lol. So often I'm unprepared for dinner, and I think it's because I'm cooking all day long! I just don't feel like getting back into the kitchen for dinner! This would be a lifesaver! I feel like that a lot too, so it helps to have easy dinners on hand! Thanks, Ashley! All of the vibrant colors in here are terrific! Pretty and tasty! When I walked outside this morning it was actually NICE out, so I'm starting to get excited about fall... don't get me wrong, I'm not ready to give up Summer yet, but I'm starting to become ready to embrace fall. ;) I always have success rice in my pantry - that stuff is a life saver! Loving these bowls, Gayle! Bowl fully loaded with delicious South West ingredients and flavors? SIGN ME UP! These are just perfect! Totally doing this for dinner one night this week! Pinned of course! Cheers, Gayle! It was chilly this morning, about 58 degrees, so fall is definitely on the way! Thanks for the rice love and pin, friend! We can alwayssss use simple dinner ideas!! I am getting so pumped for fall - it was just a tinyyy bit cooler out this morning and I was giddy! haha These bowls sound awesome! You know I can't turn down anything southwest flavored! It's definitely starting to feel like fall in the mornings! Thanks for the kind words, Ashley! This would definitely be a crowd-pleaser in our house, and I'm all about the quick and easy weeknight recipes now that we're back in school. Love it! I can't believe how quickly this summer flew by. I feel like it just started but I am definitely excited for all the cozy meals that fall brings. Like these yummy rice bowls! Love the zesty flavors and how easy these come together! Thanks, Kelly! The flavors make these bowls so comforting! looks super flavorful Gayle! I really don't know where time has gone either, can't believe summer is almost over! This rice bowl looks delicious and I especially love the Southwestern flavor you gave it! Thanks for the kind words, Pamela! 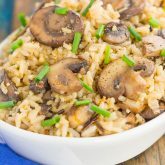 You really feel like you're eating something when using brown rice vs. white...so hearty and delicious! This dish is perfect! This looks like a perfect weeknight dinner....quick, filling, and delicious! Even though I'm no longer in school, I still get excited about back to school season! I just love buying school supplies! 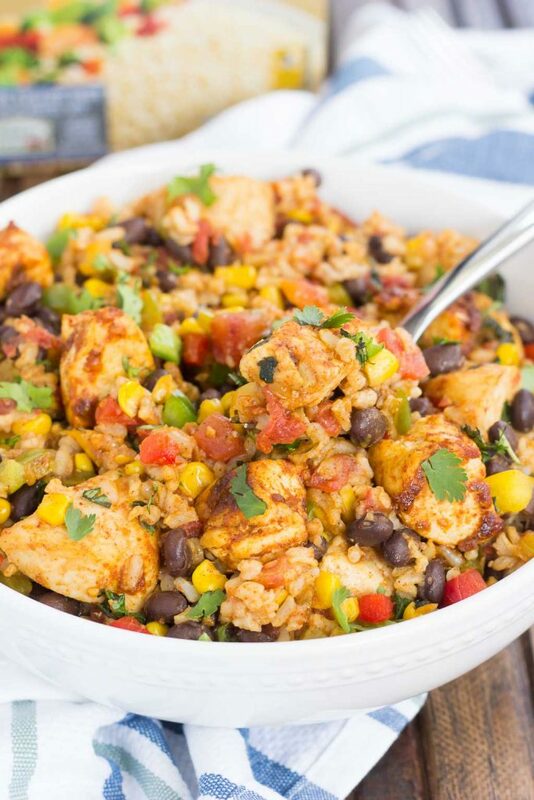 This southwest chicken and rice bowl looks like the perfect weeknight meal! Thanks, Medha! It makes this dish so good! Those boil in the bag rice thingies are so convenient! 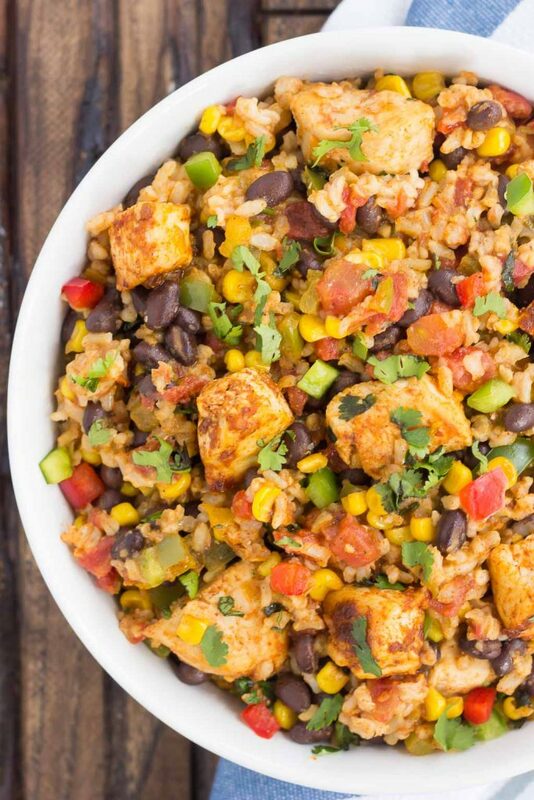 Love all the southwestern flavors you added to this rice bowl. It looks delish!! Aren't they the best? Thanks, Christin! I'm totally adding this to my to-make list! Looks amazing. I love this! This is a favorite dinner of mine. I love that they have whole grain brown rice!!!! so delicious! yum! Thanks for the kind words and for stopping by, Kaly! I was wondering if you had any idea of the number of calories in a serving?? It's a great dinner and seems pretty healthy. I used the low sodium taco seasoning and it was still very tasty!! Hi Jami! Unfortunately, I don't keep track of the calories. Since I'm not a dietician or expert in any way, I don't want to give the wrong information. There are calculators out there that could help you, though..if you use my fitness pal app, that's a good one that I recommenmd. So glad you enjoyed this and thanks for stopping by! Hi Marguerite! You can forgo the beans entirely or use another kind if your prefer. You could also swap another vegetable in its place. Thanks for stopping by and hope you enjoy! What size bag of rice was used? Hi Meghan! I used a 14 ounce bag. Hope that helps!